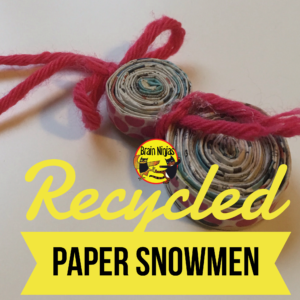 Here’s how to make your own recycled paper snowmen. 1. Choose a piece of paper about the size of an 8.5 x 11. 2. Fold the paper in a thin row and apply a small amount of glue. Keep folding this paper until you have a thickness of about four folds. Glue the paper shut. 3. 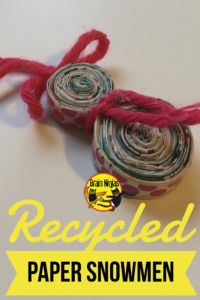 Trim the paper lengthwise so you are left with just the folded paper. 4. Repeat this process for as many pieces as you will need. To make a snowman you will need three of these pieces. 5. Roll the paper in a spiral fashion for the width you need. To make a snowman you will need to make three rolls: one small, one medium and one large. Apply glue along the way so the paper stays in place. 6. Trim the end when it reaches the desired width. Use an elastic band around the roll to hold it in place until the glue dries. 7. Once you have three pieces rolled and dried, you can attach them to make a snowman by using hot glue to hold each of the circles together with each other. 8. Attach a piece of string or yarn to the top so your ornament can hang. 9. Attach decorations as needed to make your snowman complete. You can even paint the paper if you wish. To make a large Christmas ball, simply make one roll much larger and then decorate it. This rolling process can be used to make almost anything. One of our students experimented and made a Christmas Tree by folding the paper back and forth instead of rolling it. Some students also made hearts and snowflakes. How did your snowmen turn out? Be sure to tag us on social media so we can see! What else did you make? Leave your suggestions in the comments below.